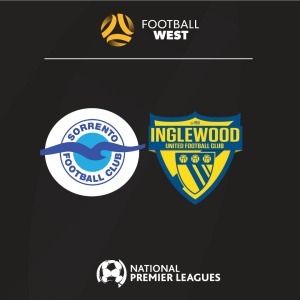 Sorrento continued their strong start to the season with a 2-0 win over Inglewood United at Percy Doyle Reserve on Saturday afternoon. Second half goals from Alex Morgan and Jordan Roberts were the difference for The Gulls, securing their first home win of the season. Inglewood looked to have found a breakthrough against the run of play as Steve Sokol bundled the ball over the line in a goalmouth scramble, but a foul meant that the goal was disallowed. Sorrento were demanding a penalty when Inglewood defender Jamie Murphy’s attempted clearance struck his arm inside the box, but the referee waived for play to continue. Morgan finally found a breakthrough for the home side in the 77th minute, his shot skimming the crossbar as it went in. A great through ball by hardworking striker Cameron Teece put Jack Salter through on goal, but the substitute unselfishly passed to Roberts who doubled Sorrento’s advantage. Roberts was superb throughout the match and dispossessed Inglewood defender Scott Blackmore twice in the closing stages of the match, but the home side failed to extend their lead and the match ended 2-0.